The Christ Church Wednesday Bible Study is reading and talking about the book "Prayer Begins With Relationship", by Cynthia Hyle Bezek, a study in the Breakthrough Prayer: Studies for Small Groups series. The premise of the study is that prayer begins with relationship between the believer and God. Prayer is inherently a relational interaction between you and God. Prayer is a dynamic conversation between two individuals who love, care for and enjoy one another. It is These are the notes for the introduction to this study. To purchase the book and study along with is click this LINK or the link after the notes. If you surveyed books on prayer in a Christian bookstore, you'd find varied and often conflicting advice. Some authorities insist that successful prayer is scheduled; others favor impromptu prayer. One writer says fasting should accompany prayer, but another tells us to pray in any circumstance. Still another says that prayer is best done when alone, though someone else urges us to join with others. Some claim that prayer requires careful preparation and thought, while a conflicting authority says prayer should flow spontaneously from our hearts. Wisdom is needed as much for prayer as for any other area of human living. 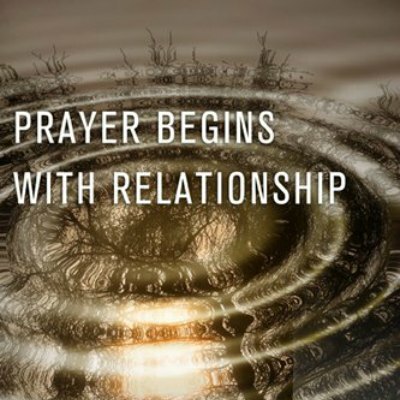 Prayer is a relationship. It is interacting between you and God. It’s a dynamic conversation between two individuals who love care for and enjoy one another. What does it say about our relationship with God if we never pray? If we never communicate with Him. Matthew 7:16‭-‬20 NIV By their fruit you will recognize them. Do people pick grapes from thornbushes, or figs from thistles? Likewise, every good tree bears good fruit, but a bad tree bears bad fruit. A good tree cannot bear bad fruit, and a bad tree cannot bear good fruit. Every tree that does not bear good fruit is cut down and thrown into the fire. Thus, by their fruit you will recognize them. Doesn’t it make sense that one fruit of our salvation is a desire to communicate with our Savior? One of the reasons some Christians don’t pray is because God is still like a new acquaintance. That doesn’t mean we instantly become “prayer warriors.” When we first meet someone, there is still sometimes awkwardness until we get to know each other better. We need to take time to learn about each other. Sometimes we do this with the Lord. Psalm 33:13‭-‬15 NIV From heaven the Lord looks down and sees all mankind; from his dwelling place he watches all who live on earth— he who forms the hearts of all, who considers everything they do. Psalm 139:7‭-‬12 NIV Where can I go from your Spirit? Where can I flee from your presence? If I go up to the heavens, you are there; if I make my bed in the depths, you are there. If I rise on the wings of the dawn, if I settle on the far side of the sea, even there your hand will guide me, your right hand will hold me fast. If I say, “Surely the darkness will hide me and the light become night around me,” even the darkness will not be dark to you; the night will shine like the day, for darkness is as light to you. He can see everything, and knows all things. 1 John 3:20 NIV If our hearts condemn us, we know that God is greater than our hearts, and he knows everything. Psalm 139:1‭-‬2 NIV You have searched me, Lord , and you know me. You know when I sit and when I rise; you perceive my thoughts from afar. Then our prayers can become empty or even hypocritical. Jeremiah 31:3 CEV Some time ago, the Lord appeared to me and told me to say: Israel, I will always love you; that's why I've been so patient and kind. He urges us to move beyond the level of casual prayer to something deeper. To ramp up your prayer level, get honest. 1 Corinthians 2:14 ESV The natural person does not accept the things of the Spirit of God, for they are folly to him, and he is not able to understand them because they are spiritually discerned. Romans 8:26 ESV Likewise the Spirit helps us in our weakness. For we do not know what to pray for as we ought, but the Spirit himself intercedes for us with groanings too deep for words. Close friends discuss specific goals; when we draw closer to God in prayer, we’ll want to know His will. Genesis 18:17‭-‬19 ESV The Lord said, "Shall I hide from Abraham what I am about to do, seeing that Abraham shall surely become a great and mighty nation, and all the nations of the earth shall be blessed in him? For I have chosen him, that he may command his children and his household after him to keep the way of the Lord by doing righteousness and justice, so that the Lord may bring to Abraham what he has promised him." John 15:14‭-‬15 ESV You are my friends if you do what I command you. No longer do I call you servants, for the servant does not know what his master is doing; but I have called you friends, for all that I have heard from my Father I have made known to you. When our deepest desire is intimacy with the Lord, our prayer life will reflect this passion and urgency. Yet our desire for God is nothing compared to His desire for us. Just as He delighted in Zion, He takes delight in all His children, rejoicing over them with singing. Author and blogger John Piper says, “God wants intimacy with you. Christ has done all the hard work in the cross to make it possible.” In His sacrifice on the cross, Jesus showed His deep desire to befriend and save us. He is truly the biblical example of a friend who sticks closer than a brother. John 15:13 ESV Greater love has no one than this, that someone lay down his life for his friends. Which of the following do your prayers most closely resemble? a. A wish made when throwing a coin in a fountain. b. A shrewdly crafted proposition to your spouse when you're unsure if he or she'll agree. c. A distant hope a child experiences when daydreaming of something he or she wants to have. d. Some candid advice offered to a boss who needs to make certain changes for everyone's benefit. e. A desperate plea made in the face of imminent disaster. Proverbs 15:8 (NLT)8 The LORD detests the sacrifice of the wicked, but he delights in the prayers of the upright. Proverbs 15:29 (NLT)29 The LORD is far from the wicked, but he hears the prayers of the righteous. What is the focus of these two verses? The focus is righteousness. The both say that the Lord hears and delights in the prayers of the righteous and upright. In both proverbs, it is the upright whose prayers delight God so that he hears them; conversely, it is the wicked whose prayer is so detestable that God distances himself. Remember what Jesus said in our Sermon on the Mount study? Matthew 6:5-8 (NLT)5 “When you pray, don’t be like the hypocrites who love to pray publicly on street corners and in the synagogues where everyone can see them. I tell you the truth, that is all the reward they will ever get.6 But when you pray, go away by yourself, shut the door behind you, and pray to your Father in private. Then your Father, who sees everything, will reward you.7 “When you pray, don’t babble on and on as people of other religions do. They think their prayers are answered merely by repeating their words again and again.8 Don’t be like them, for your Father knows exactly what you need even before you ask him! Then He gave them a model for the way we should pray. Why is this factor sufficient by itself to account for whether God hears our prayers or not? What determines whether God hears our prayers or not is how much we are like Him and His character or our righteousness. God's concern for our children's character is greater than his interest in granting our requests. Like any boss, he primarily desires faithfulness in an employee's work before granting private requests. Like any kind of leader, he willingly hears requests made by genuine followers whose loyalty is constant and sure. 1 John 3:22 (NLT)22 And we will receive from him whatever we ask because we obey him and do the things that please him. How do we become righteous? Clearly, upright cannot mean sinless. Proverbs 28:13 (NLT)13 People who conceal their sins will not prosper, but if they confess and turn from them, they will receive mercy. The essential difference between the upright and the wicked lies in what they do with the sin in their lives. The wicked conceal it, evidently so that they may persist in it. The upright, on the other hand, acknowledge their sin and renounce it. The New Testament reveals by faith in Jesus Christ, we are accounted to be fully righteous. Proverbs 16:3 (NLT)3 Commit your actions to the LORD, and your plans will succeed. What does it mean to commit something to the Lord? What part do you think prayer plays in committing whatever you do to the Lord? Prayer is the chief way we commit what we do to the Lord. We ask for understanding as we consult God's Word concerning his purposes, plans and values. To know these is paramount if our plans are to succeed. We ask him to lead us to information or to wise men and women who can advise us. Finally, we ask him to do those things we cannot do so our plans will succeed. Committing our actions to the Lord is not a blank check if we are not in God’s will for us. For example I can pray and say if you answer I commit that I will do so and so for your kingdom. If our plans conflict with something he's determined to do, they will fail. That would be like trying to do my will under God's power: God won't be manipulated this way, even though many try–including a high percentage of Christians! Proverbs 20:25 (NLT)25 Don’t trap yourself by making a rash promise to God and only later counting the cost. That’s like praying “ "If you do thus and so, God, I'll do this and that." When we do that we end up being frustrated, and anxious. In what situations might we be tempted to make a vow rashly? When we are in a financial tight, or sick. Why do rash vows become a trap? Such vows are a trap in the same way that any hastily conceived plan is a trap—knowledge and wisdom which we do not have and circumstances which we cannot control can easily render us incapable of doing our part. In giving this parable Jesus is cautioning against making rash decisions or promises. He suggests to careful, detailed, rational thinking in which you consider all aspects of what you’re getting into before you make the commitment. Such careful thinking is opposed to an impulsive decision made in a moment of intense emotion, without much thought about the consequences. Proverbs 28:9 (NLT)9 God detests the prayers of a person who ignores the law. If we want God to hear us, we must hear him. The law in Proverbs 28:9 means teaching, guidance, instruction, and includes not only Mosaic books but all other prophetic and wisdom teaching in the Scriptures. before bringing our requests to God on a matter, we should first know what God has already declared on the subject, and so avoid asking things contrary to his will. Next week we are really going to get into the fact that we have a friend to friend relationship with God so we are going to define the relationship.